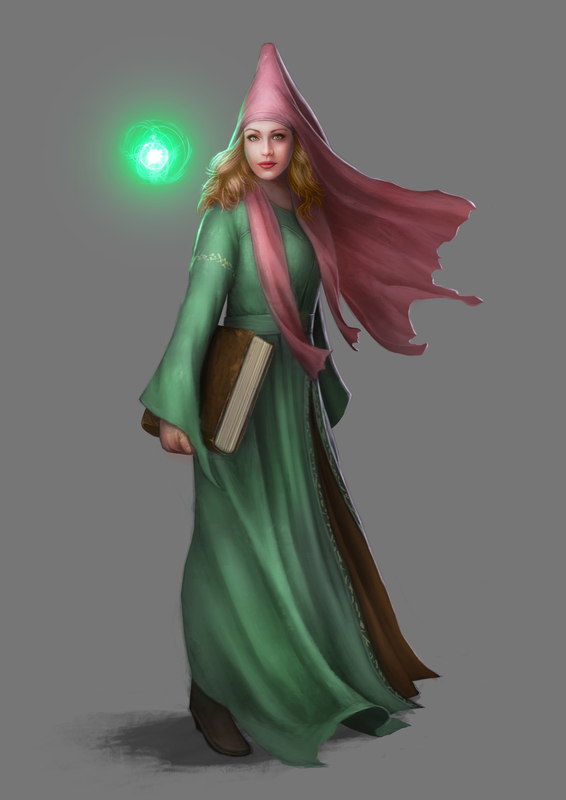 The priestesses of the Green Lady, Feanara, are found in the feudal kingdom of Zarubain. Only females are allowed to join the priesthood. Priestesses form a tier of the upper class in a society divided into “those who work, those who fight, and those who pray.” They collect tithes from peasants and nobles alike and hold services each week. They are required to know all about religion and theology. Until the age of 33, they must stay abstinent. Upon reaching that age, they may take a husband of the knightly caste; however, rumors abound that marrying a priestess is bad luck and brings misfortune. The priestesses serve Feanara, the goddess of the fey and the woodland creatures. Priestesses are rumored to have powers of magic; however, these powers are said to tend toward the manipulative rather than the aggressive, and are generally not as effective in direct battle. A skilled priestess of Feanara may make another fall in love with her through bewitchment, or cause people she’s only just met to view her as a good friend. In addition, most priestesses are trained in basic self-defense. Being forbidden to wield iron weaponry, many defend themselves with clubs or quarterstaffs; most, however, engage in hand-to-hand combat. Some higher-ranking priestesses are bound to knights, and the troubadours in the royal and ducal courts often sing songs of their forbidden love. These knights of the realm help give the priestesses special protection in battle. One of the most famous of these pairs is the original queen of Zarubain, Melisande Hernaut, and her knight companion, Sir Jourdain of Gundavold, who led armies against the feuding Zarube tribes and brought them under one rule. Full priestesses are referred to as reverend ladies because they are considered on the same societal level as the nobility. In all, there are probably 1,000 reverend ladies and many more subordinate priestesses. The domains of the priestesses are called weyrds. Reverend Ladies who own land are considered to own grand weyrds. I’m assuming this is all in regards to something you are writing and I have to say, it’s very well thought out! The different mythologies and lore that I see shining throughout this piece are enough to make this history buff and fellow fantasy writer very very excited! It is! I am, indeed, a history buff. I base my world on real cultures, mostly. 🙂 Glad you liked it!